Writing is a creative process. Sure, it’s hard work and needs to be taken seriously – sometimes. But at the very beginning of a story, or when you hit a boggy patch, take time to play. Julia Cameron speaks of “listening to our artist child within”. Allowing ourselves to be childish – to play – is essential to the creative process. I’ve written elsewhere about the distinction between so-called left and right brain “modes”: the left mode being more serial, rational, logical and quantitative; and the right more parallel, intuitive, connective and performative. Play can help you move from left-brain mode (required to write operational plans and budgets) to right-brain mode (required to write stories). Depending on our day jobs, some of us need more help than others to make the switch! Artists play in different ways. Here are some of my play techniques: I’d love to hear about yours. I enjoy buying stationery – even just browsing the aisles! – and the main facet that attracts me is colour. I make bright colours a routine element of my writing practice and environment, so something as boring as filing a note or a sketchy draft paragraph becomes fun. 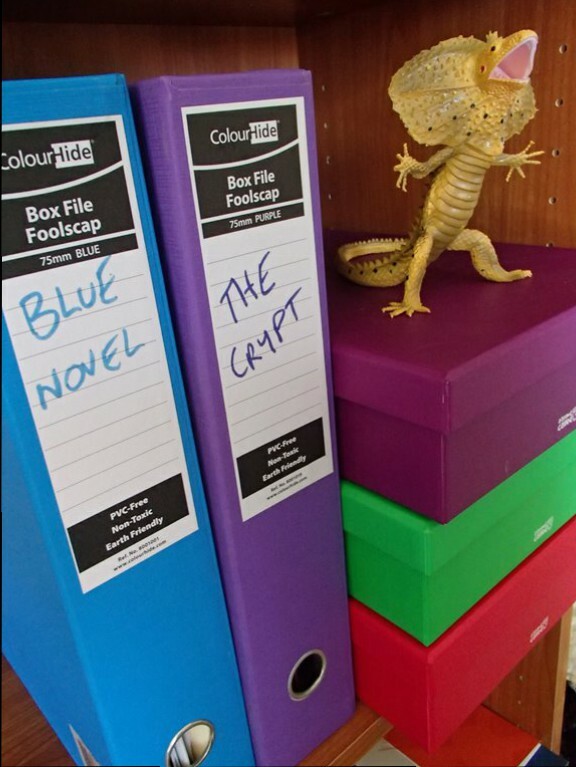 Each of my draft novels is allocated a box-file, in a colour that relates to the novel’s content. My first novel actually had the working title “Blue”. I use playful symbols of the elements to redress imbalances of mood. My office is furnished with many candle holders, for when I feel dark and stodgy and in need of fire. A wind-chime reminds me to be light and airy; a desk-top water-feature encourages a sense of fluidity. Rocks help me get grounded. 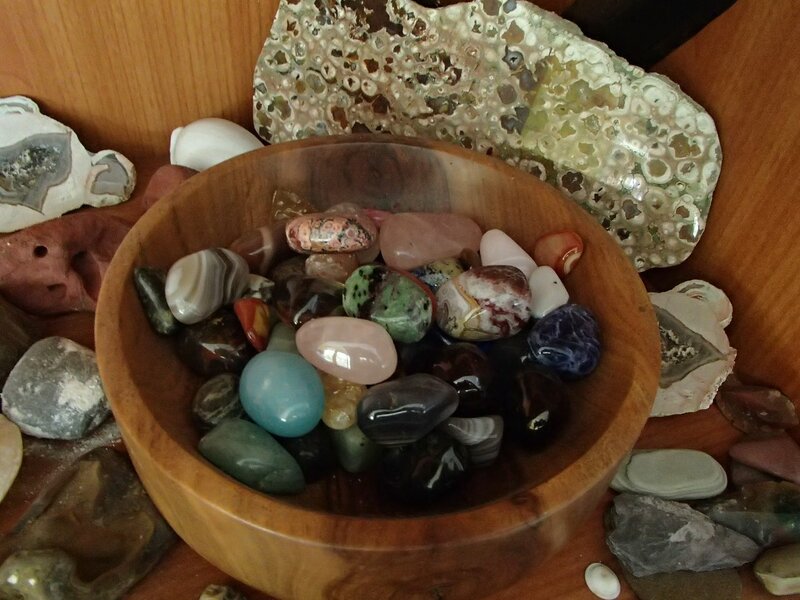 Some of my coloured touchstones represent particular qualities, and I’ll hold one or put it on my desk while writing to remind me of that quality, whether I need it for myself or a character. The meanings attached to my touchstones are purely idiosyncratic. For example, the turquoise reminds me of an editor friend who often wears that colour, and who is extremely good at organising herself to focus on the task at hand. When I need to channel Helena, I carry the turquoise around! 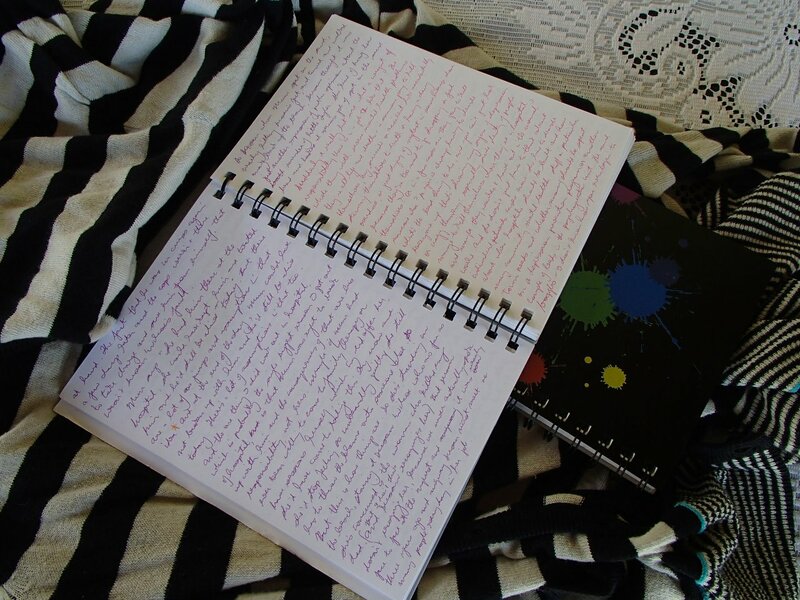 A number of my novels are written in first person, two in the form of journals. To write my YA novel, I selected a visual arts diary of the kind I thought my character Storm would love, with thick creamy pages and stout spiral binding. I bought coloured gel pens, and wrote in whatever colour I imagined Storm would select to express her mood at the time. When I began my fantasy/steam-punk/weird novella, The Serial Journal of Phileas Postlethwaite, I had just been given as a birthday present a mock leather-bound journal that tied with a thong. 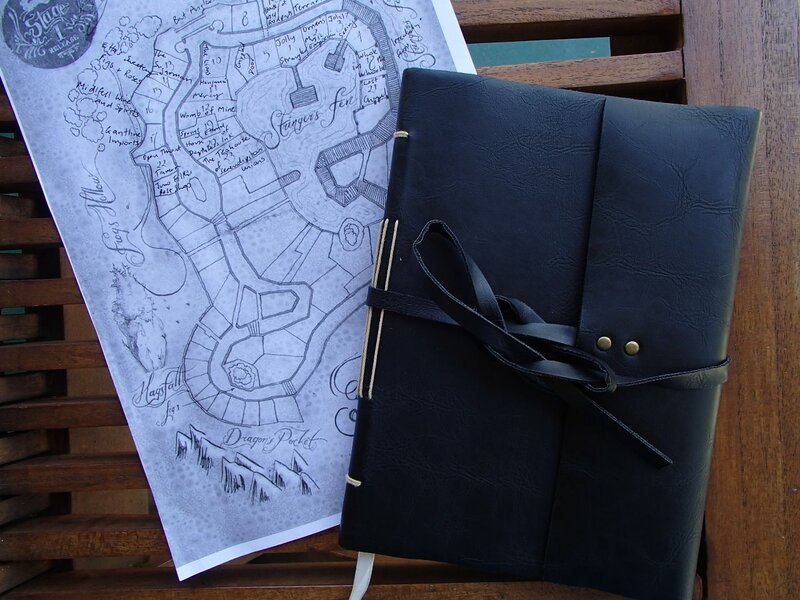 The giver intended me to use it on an upcoming tall ship voyage, since it suited the period, but I had to buy another notebook as my ship’s journal – I had filled up the gift with Phileas’ reflections on his weird world! I didn’t dress up to write as Phileas, but I did to write as Storm. In the novel, Storm has a favourite jumper with black-and-white striped sleeves. That was a jumper I’d picked up in an op shop, and often wore when I was writing as Storm, especially in the hard bits! I’m highly visual, so I like to play with visual arts materials. Coloured modelling clay is a favourite, to get into playful space. Drawing exercises are great for integrating left and right brain ways of perceiving and creating. 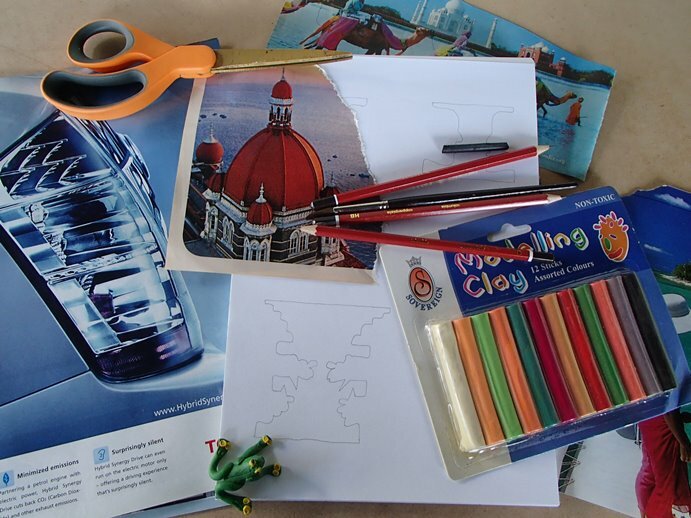 Try making a collage as a way to explore your character, setting, or theme. I use a range of playful knickknacks to encourage a creative state of mind. 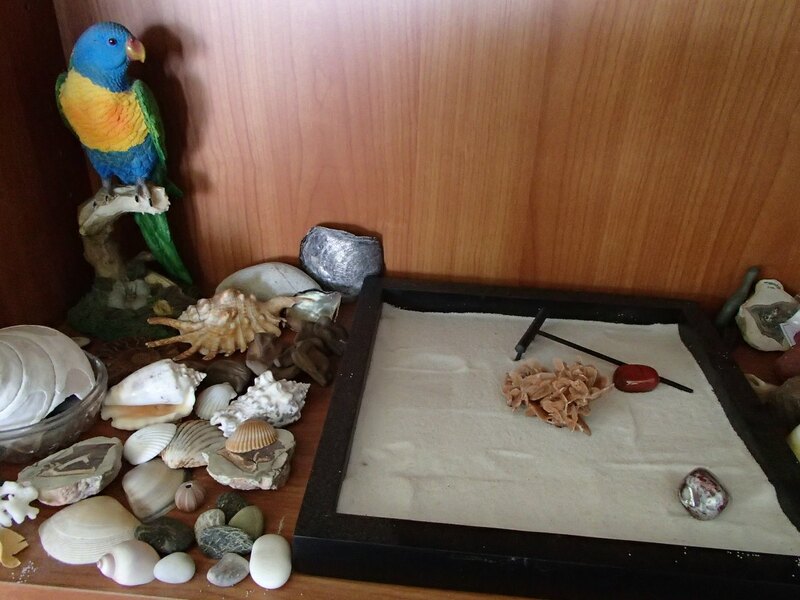 A mini Zen garden is an aid to quieting unhelpful racing thoughts. As I dismantle the previous pattern, rake the sand smooth and create something new, I can feel my brain slowing down, thinking more deeply and richly about what I want to write. A few minutes of three-ball juggling helps integrate the left and right sides of my brain and body, while contact juggling one or two balls steadies my breathing and enhances my focus. If I need to get energized, I turn to a skipping rope or hula hoop! Depending on your interests, the options are probably limitless. Just make sure your playthings are easily accessible, so the play can happen the moment you’re ready for it, and writing can flow from the play. What about you – how do you play, to help you write?